Most managers should be compensated anywhere from 15% to 20%. But there are a few managers out there who will want 25% to 30%, or maybe even more. This really will depend on their reputation and status; like how much power they have in the music industry to get the deal you want, their proven history of creating success, and so on. You may want to avoid the person or management firm asking for 30%, but on the other hand, if you clearly see their track record with real evidence of ways they can help bring in more income for you, go with it! After all, it is better for you to receive 70% of $1,000,000.00 (or more) that they help to generate and make happen for your own pocket, as opposed to you getting to keep 85% of $100,000.00 (or less) a year through a different manager asking for a lesser commission, but you are having to work twice as hard, twice as much, and dealing with more drama than you prefer. 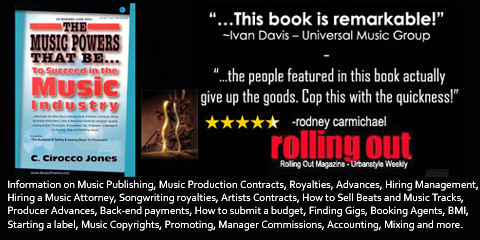 Note: We will go through various options and give you real-world guidance from 2 key music industry management firms in the next 2 chapters of the book. In some situations, you should try to avoid paying a manager his or her percentage based on your "gross" or over-all income without certain expense deductions. Many times there will always be expenses that have to be paid before you have gotten paid anything at all. As an artist, many times you should seek to pay your manager his or her commissions based only on what you actually collect - after any indispensable expenses like studio costs, or live show and touring costs, etc. For example: Say you signed a very big record deal with Universal Music or Sony to do your album, and the total deal was for $1,000,000. After you paid the recording costs, hire music producers, paid other featured artists, get samples cleared (if needed), do a music video and starter marketing/promotions, you might have about $300,000 left. Your manager would be entitled to their 20% commission from that, or $60,000. So basically remember that your manager should get a percentage of the "net" income from the initial recording deal.